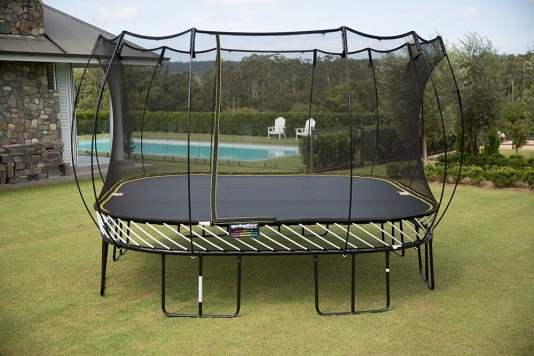 ‘Springfree’ trampolines use composite rods rather than springs which sit under the jumping surface, out of harm’s way. This means there are no hard elements on the jumping surface itself as you would get with the frame and springs of a conventional trampoline. This feature removes two of the most common causes of trampoline injuries. As you might expect, Springfree trampolines are not the cheapest on the market but their ultra-safe features might make the investment worth it. Additionally, you can get away with a smaller size trampoline generally because there are no outside springs taking up valuable space. All of the surface is a jumping surface. Frame is below the jumping surface. You cannot hit it.